Glory O’Brien is a gifted photographer, just as her mother was. She hopes that her pictures can help her to make sense of her mother’s suicide, and she has cut herself off from everyone but her grieving father and her best friend, Ellie. She worries that she is doomed to repeat her mother’s ending until the night that she and Ellie drink the bat. Yes, bat, as in flying mammal. After that, the girls acquire the ability to see a person’s past and future through many generations when they look them in the eye. This ability may sound awesome, but in reality, seeing the future can be more than a human being can bear to know. Glory begins to move through life with downcast eyes. In the meantime, Glory finds her mother’s journal in her darkroom and starts to uncover strange bits of information about Ellie’s domineering mother, who runs the commune Ellie lives on across the street from Glory and her dad. Ellie is homeschooled, and some of her choices are taking a toll on the girls’ friendship. With no friends, unsettling supernatural abilities, unnerving discoveries about her parents’ past, and an agoraphobic dad, will Glory move toward her mother’s end, or acquire the strength to overcome it? A.S. King is a reliably excellent young adult author. Her characters’ dialogue and mindset are authentically “teen,” and the parents are almost always fully fleshed-out characters, instead of cardboard cutouts or wicked villains, as in so many YA novels. Glory O’Brien is an essentially realistic novel with a touch of the fantastical, and the visions are dealt with as yet one more burden of the teen years. ***Rant Warning*** I do have one quibble, but it is not unique to King. Over the past few years, perhaps beginning with Jerry Spinelli’s Stargirl, authors routinely use homeschooled kids as the stock “Other” character, particularly “the feral child.” It seems that all homeschooled kids in books are raised on farms or in communes, and often have no experience of the larger world— which is odd, really, since they are not the ones locked up in a room with 30 other kids their exact same age all day long. Be that as it may, the homeschooled child or teen seems to be writers’ 21st century, American Émile. As a former homeschooling mom, I am beginning to see this as a tiresome trope. It is true that homeschooled children are not Just Another Brick in the Wall, because, after all, that is the point. However, homeschooled kids come from all kinds of families, economic conditions, and geographic areas. They move within a broad range of children and adults every day, and are just as likely to program your computer as to chop your firewood. So… let’s give it a rest, shall we? 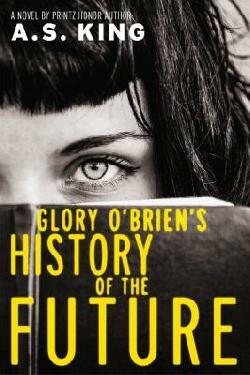 Glory O’Brien’s History of the Future is an absorbing coming-of-age novel for upper teens to adult. Disclaimer: I read a library copy of this book. Opinions are solely my own, and do not reflect those of my employer or anyone else. Rants are optional and free of charge.